Our red wines are unique to most other reds because we do not use wooden barrels for aging; we use stainless steel tanks! For thousands of years wine was made in pottery or skins, so that the wine tasted fruity. The French started barrel aging in the 1400's thus turning fruity wine into something else. Hmmm, wine that tastes like fruit or wine that tastes like a tree! Of course, real wine drinkers love wine any way it's aged!! Our #1 seller, the sweetest red wine on our menu; makes a great spritzer or punch when you add 7-Up or Sprite, instant Sangria. Goes well with hamburgers, pizza, spaghetti or dark meat. Medium red wine, like Merlot or Burgundy. 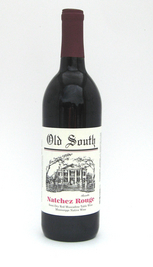 Excellent with hamburgers, roast beef, venison, steak, and the like. Great with Italian marinara dishes. Not for the faint of heart! The only dry red wine we offer. Mississippi Chianti.